The next time you go out to eat, consider ordering a lollipop to wash down your chicken caesar salad. You might as well: That Coke you reach for has enough sugar to create one, an artist from New Zealand has proved. Hargreaves pours the sugar mixture into his molds. 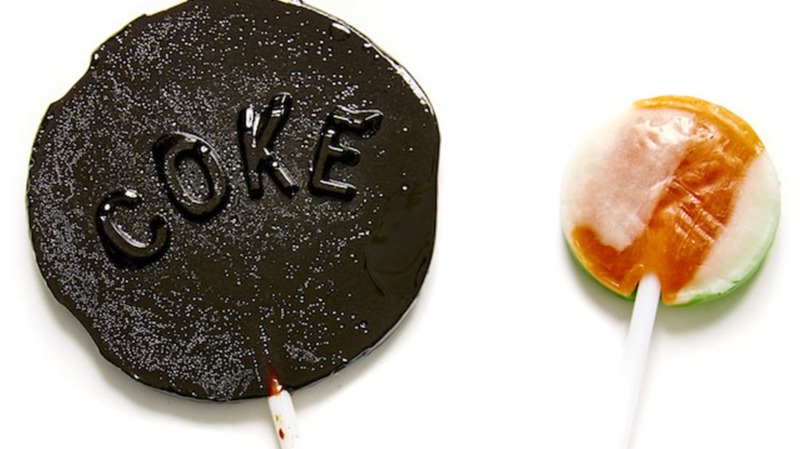 Hargreaves traces around the bottom of each beverage bottle and brands each resulting disk with the drink's name; he then uses these disks as stencils to create molds for his candies. Next, Hargreaves boils the liquid out of each drink on a stove top and pours the remaining sludgey mixture of sugar, food coloring, and other ingredients into the molds. The molds go into the fridge to harden, and, Voila! Soda 'pops. Watch Hargreaves at work in the video below. Unsurprising, Mountain Dew punched in as the sugariest beverage with 77 grams (2.7 ounces) of the sweet stuff. But even the drinks marketed as “healthier” options—such as Vitamin Water, Honest Tea, and Zico coconut water—contained enough sugar to create a lollipop. So stick to water for your hydrating needs—if you think convenience store beverages are good for you, then you’re the sucker.